Collecta are going to introduce a wonderful replica of a juvenile Tyrannosaurus rex, a T. rex with feathers. Anthony Beeson, the designer of this figure has commented that he has given his baby Tyrannosaur plumage based on a woodland bird, thinking that these small and vulnerable predators would hide in forests to avoid larger carnivores. The replica is a very accurate representation of the latest scientific interpretation of young Tyrannosaurs. The model measures approximately ten centimetres in length. Joining the T. rex juvenile model next year is this lovely replica of Gastonia (G. burgei), an armoured dinosaur believed to be closely related to Polacanthus. This dinosaur has spikes, plates and a heavily armoured head, a contemporary of the fearsome Utahraptor, this armour would have come in very handy. The model measures around fifteen centimetres in length and should work well in dioramas with the existing Collecta Utahraptor model. Last but not least for the moment, comes a model of the bizarre-looking prehistoric mammal called Arsinoitherium. Arsinoitherium was a distant relative of today’s elephants, fossils have been found in Asia, Oman and we have seen some examples discovered in Egypt. Great to see a model of this hoofed herbivore added to the Collecta model range. 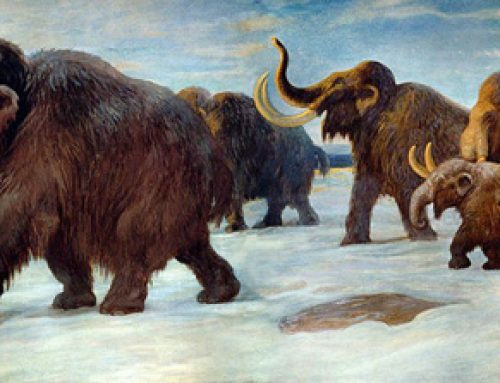 Prehistoric beast distantly related to modern elephants. The Arsinoitherium prototype measures around twenty centimetres in length and based on the size of an adult, male Arsinoitherium being around 3.4 to 3.5 metres in length, we estimate that this figure will work well with Collecta’s other prehistoric mammal models in 1:20 scale. Looks like Collecta are going to have a super 2014. These models should be in stock late in 2014 perhaps mid Summer? Very awesome models there-But I have a question-Is the Arsinoitherium in deluxe size like the Deinotherium and Megacerops?Thanks. Its all a matter of personal opinion as to the Arsinoitherium, the Safari Ltd replica came out a long time ago, with its wrinkled skin and pink ears it was quite popular, however, this piece is now rare and expensive to purchase. The Collecta Arsinoitherium has cleaner lines and a partial coat of bristly hairs which is a nice touch. It does not really matter to us, its down to the individual to choose a favourite should they wish to do so. It is pleasing to see a model of this genus coming out though. 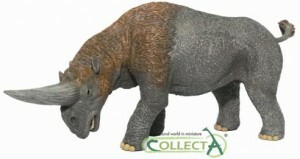 We think that the Collecta model is about 1.5 cm longer than the Safari Arsinoitherium. Hope this helps.